Locale is a set of parameters that defines the user’s language, country and any special variant preferences that the user wants to see in their user interface. Usually a locale identifier consists of at least a language identifier and a region identifier. The locale settings are about formatting output given a locale. For example you can see some of the settings for the Slovenian locales on my machine in the screenshot below. Even more options are available if you click the “Additional settings…” button. Double-click the Region and Language icon. 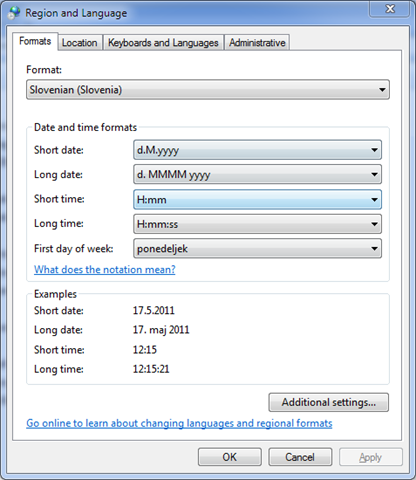 The Region and Language dialog box appears. Please note that you have to be logged in with an account with Administrative Privileges in order for this to work. 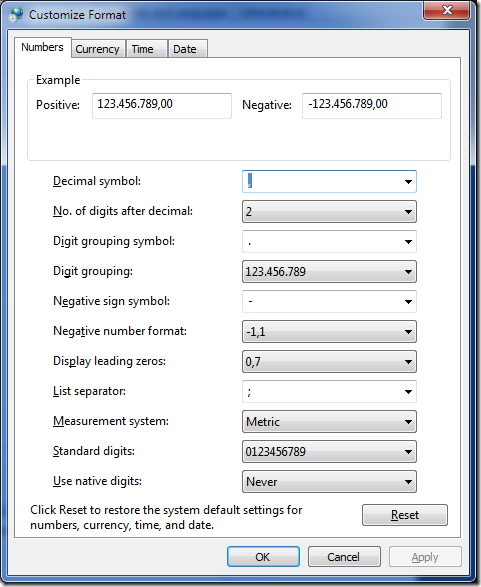 This sets the locale for all categories (number format settings, currency format settings, date/time settings, etc.) to the user’s default setting. The following code converts values of two NiceForm (or NiceLabel Portal) variables (that are represented as strings) into floating point numbers using the current locales, calculates the difference between them and assigns this new value to the third variable value (again as a string value). Script should work in both NiceLabel Portal (code block after the if statement) and NiceForm (code block after the else statement). Again code for NiceLabel Portal and NiceForm is a little different. It does however in both cases display date and time in different formats using user’s current locale settings. d5.Value = "Day of the week: " + dt.ToString("ddd") + " (abbreviated), " + dt.ToString("dddd") + " (full)"
d6.Value = "Month name: " + dt.ToString("MMM") + " (abbreviated), " + dt.ToString("MMMM") + " (full)"
d5.Value = "Day of the week: " + dt.ToString("ddd", culture) + " (abbreviated), " + dt.ToString("dddd", culture) + " (full)"
d6.Value = "Month name: " + dt.ToString("MMM", culture) + " (abbreviated), " + dt.ToString("MMMM", culture) + " (full)"
‹ How can I work with files in NiceLabel Portal?